Andy: I’m not a huge white rum guy, and I think it’s because most places only serve Bacardi. I HATE Bacardi. With a passion. It’s the number one liquor in the country and for the life of me I can’t figure out why. Marketing I guess. Anyway, this is not like Bacardi at all. Thank God. It has way more flavor and less of a harshness to it. It isn’t as good as Clement White Rum or Sailor’s or even 10 Cane, but it’s a heck of a lot better than drinking filthy, nasty Bacardi. 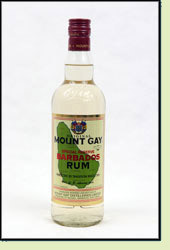 Adrian: Mt Gay White Rum is a decent choice for a mixer. It’s not great in a rum and Coke, or by itself, but it isn’t bad. It’s way better than Bacardi.